Monica Gale Top STAMPIN'UP! UK Demonstrator: IS HEREEEEEEEEE!!!!!!!!!!!!!!!!!!!! Woohooo finally after weeks and weeks of sitting on the exciting new mini catalogue news, the day has finally arrived. Is here and is live you can fill your boots and I am sure you will LOVE what's on offer. There is soo much lushness you can't possible decide on what you want first and if your list is BIIIIIG then why not join one of my Virtual hostess clubs? We start a new one in April and there's only 5 spaces left you need to be quick, check the top of my blog for more details then get in touch, you will love getting lovely products delivered straight to your door every month. Positively Y U M !! Now as you know I like to do a special Offer for all of those who can't wait to get their hands on the new goodies. Place an order of £45 or more with me between today and 11 April 2010 by 10pm and be in with a chance to win one of those fabulous prizes. For each 11 orders placed with me the following prizes will be up for grabs. You loved my last draw and this time will be no different, join in the odds are FABULOUS, out of 11 people 6 will get an extra prize, a really GREAT DEAL. it HAS TO BE this beautiful birdie punch. I cannot stop using it, I LOVE it so much. 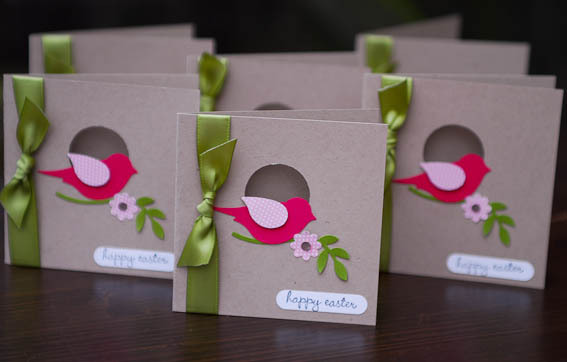 These are some Easter cards I made for my Virtual Club members. Kraft base Rose Red bird body, Old Olive branch and the wing and tiny flower was punched out from some tiny polka dot paper from the Sweet pea stack, now BEWARE if you're a paper addict you're in trouble as the papers are to die for ALL of them, the catty pictures don't really do them justice really. boohoo catalogue not online yet. Happy Birthday Monica! Have a great day. Monica! I love these - I will have to CASE! Happy Birthday! Happy, Happy Birthday Monica! You seem to be getting younger though, so what's your secret? !